“Mickey Mouse!” “Minnie Mouse!” These are two of the most popular words I hear out of Eva’s mouth these days. From out of nowhere, she suddenly became obsessed with these beloved Disney stars. At first, we didn’t own any Mickey books or toys and so I figured she must have learned about Mickey and Minnie at daycare. After speaking to her teacher, she admitted that the daycare also didn’t have any Mickey Mouse merchandise. This lead to further confusion on my end. After a few minutes of chatting about Eva’s new idol, her teacher then remembered that one of the children in the class has a Minnie plushie that she sleeps with at nap time. Ah, ha! Eva must have been eyeing this toy carefully! A few days later, we decided to show Mickey Mouse Clubhouse to Eva online. This led to us acquiring stuffed animals, books, clothing, kitchenware, and other items. 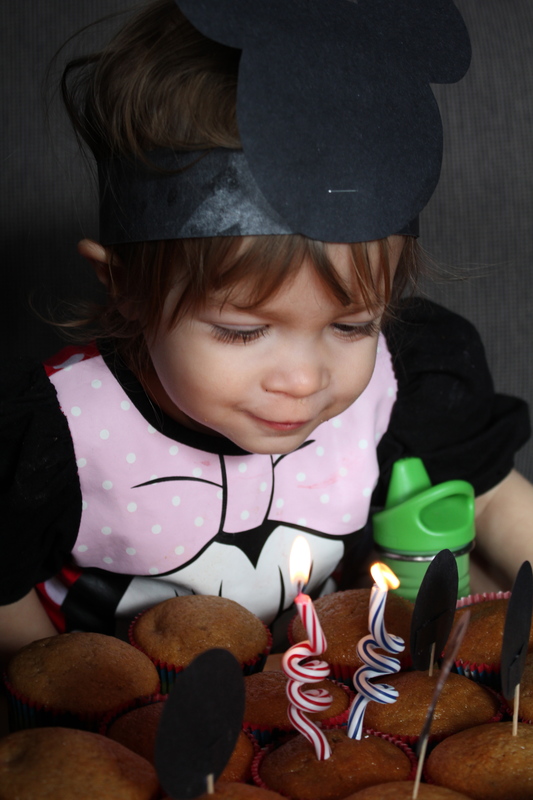 For her second birthday I had planned an Elmo theme knowing that Eva also adores him. When I shared this plan with her closer to her birthday Eva confidently told me, “No Elmo. 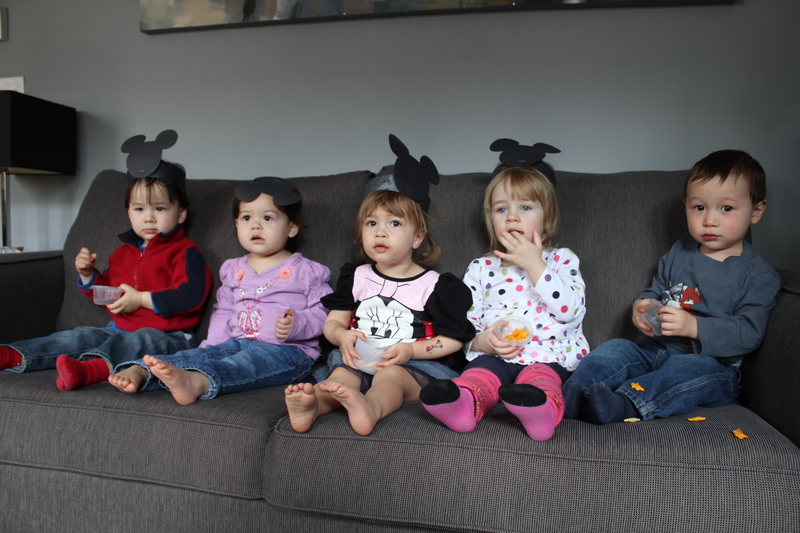 Mickey Mouse Clubhouse”. This meant more creative brainstorming for me (I can’t complain about doing this as I will admit party planning excites me), and some shopping to fulfill her wishes. 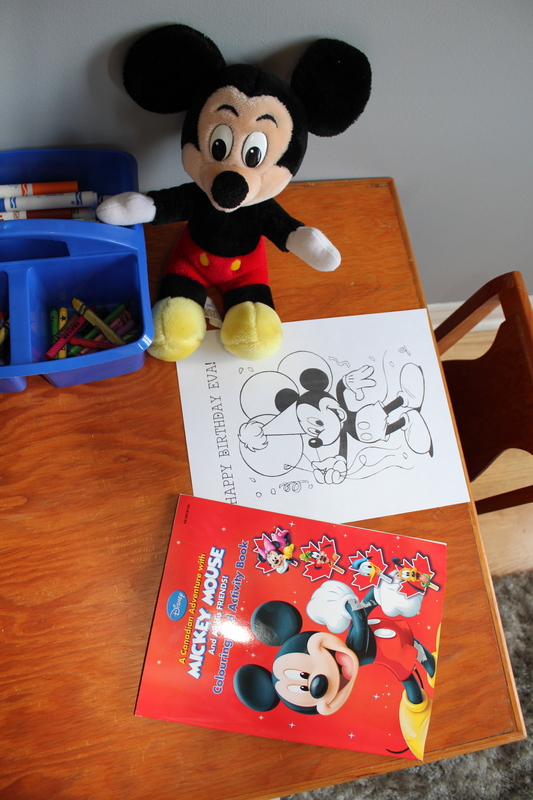 A children’s colouring table featuring personalized Mickey Mouse birthday colouring sheets, and “A Canadian Adventure with Mickey Mouse and Friends” colouring book from Dollarama. This was a big hit! 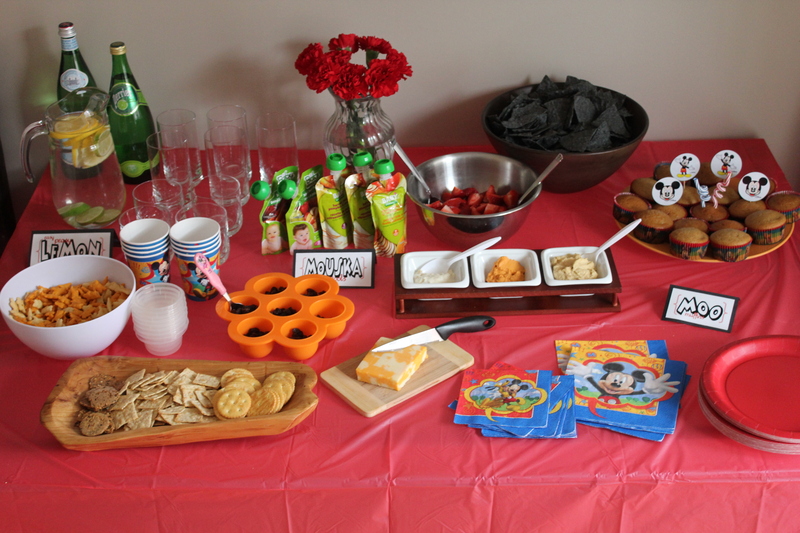 While my initial plan was to keep to a red and “black” food theme, in the end I provided healthier food options for all. Since all the children attending the party were between 20 months and 4 years, I opted to make apple cinnamon muffins instead of cupcakes with icing. Annie’s Organic Cheddar Bunnies (mice would eat these cheesy snack, right?) and the raisins were ever so popular with the toddlers! The best idea for portion control was to put out mini Tupperware containers so that children could carry around their snacks. My husband and I both love sparkling water with lemon or lime. This fit in perfectly with Mickey’s tag line from the Clubhouse show, “Easy Peasy Lemon Squeezy”. Find the free printables from Mimisdollhouse here. For party favours, I wanted to give my friends something useful. When I found out that Mickey Mouse bandaids exist, I went hunting for them (I found them on sale at Loblaws for $2.50/box)! I decided to place them inside a small sand bucket and stuck a permanent letter sticker on the side of the bucket to identify the child’s first initial. 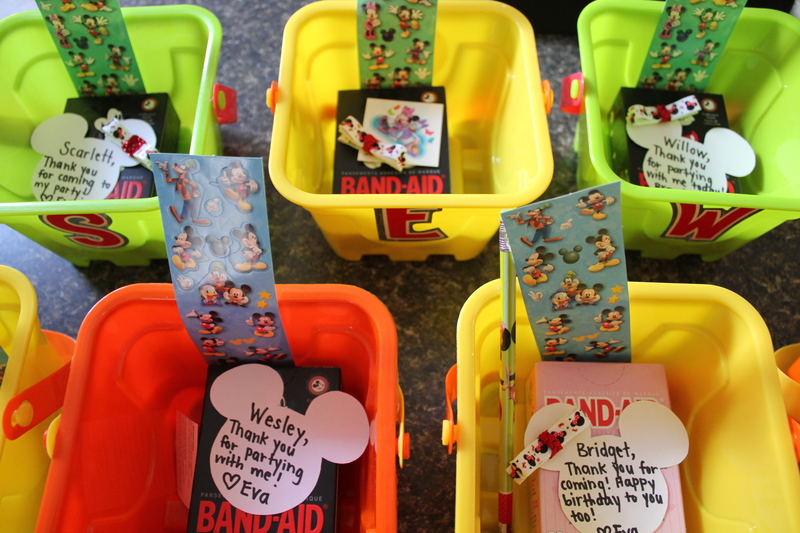 The bucket was then filled with some temporary Minnie tattoos, stickers and a personalized thank you note written on a Mickey Mouse shaped head that I cut out of thick white paper. During the actual party, in addition to eating sweets, we had a circle time that involved singing my daughter’s favourite songs “Rolley Polley” and “Sleeping Bunnies”. 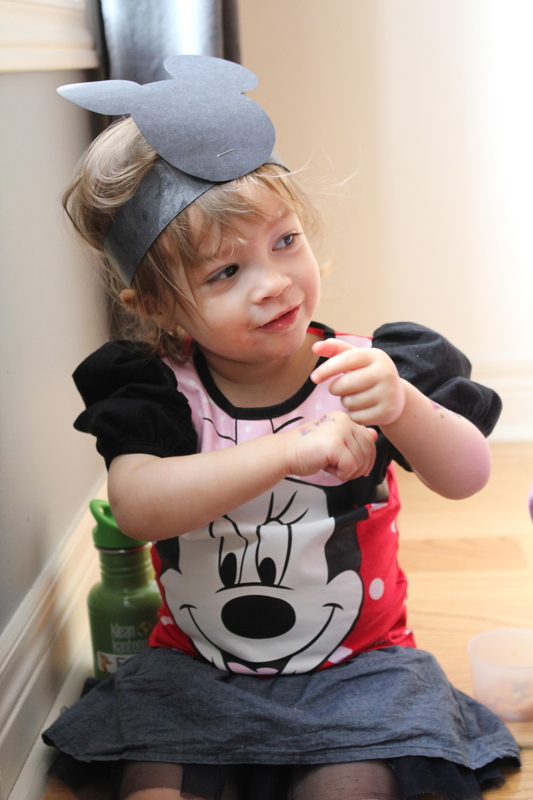 I made Mickey Mouse bandanas out of black construction paper, and I was surprised that Eva wore hers the entire time! We then put temporary Minnie tattoos on most of the children. The birthday girl wanted two – one on each arm! Happy 2nd birthday to my sweet girl!! 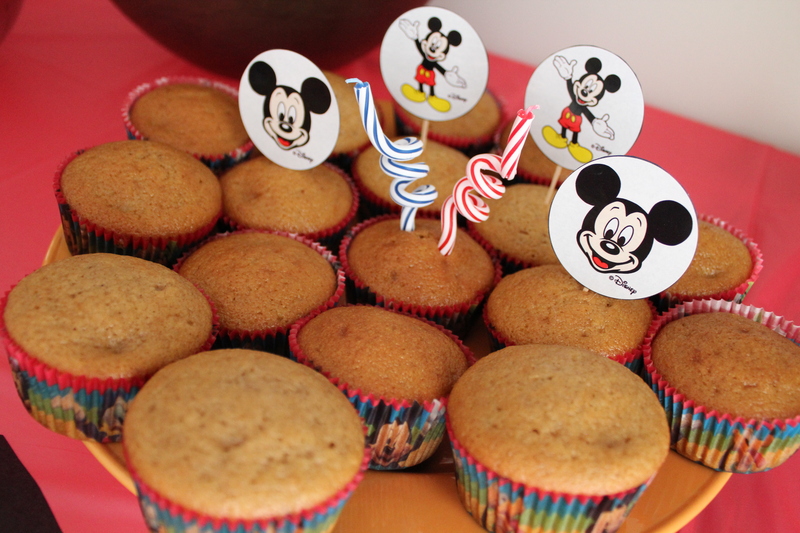 This entry was posted in favourite days and tagged 2nd birthday, Mickey and Minnie, Mickey Mouse Clubhouse, toddler birthday party. Bookmark the permalink. Sooo adorable!-especially the row of toddlers! 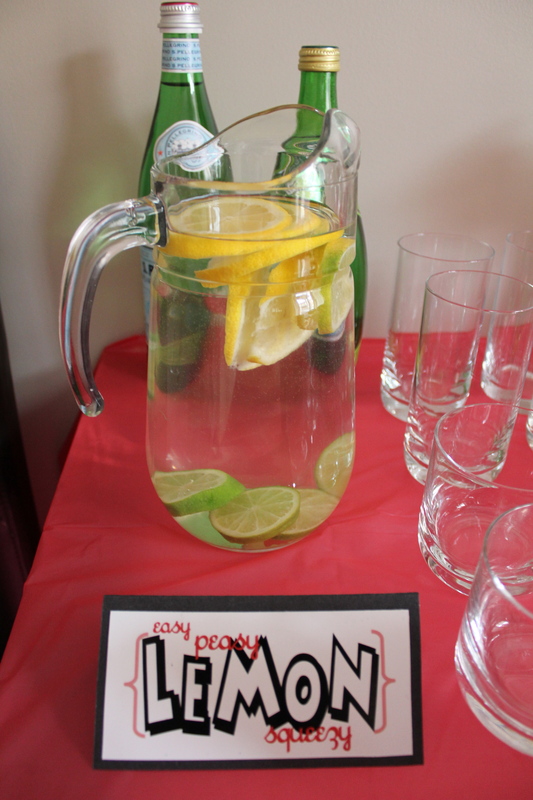 I love the lemon drink you made to go with the phrase. Happy birthday to your big girl!